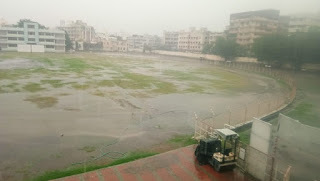 As recent rains has lashed Jamnagar City, residents of K.P.Shah vadi and Rameshwar nagar were in constant fear. On Friday water surged everywhere in this area and flooding reached the houses, many residents moved to terrace for safety. In last 2 seasons, K. P. Shah Vadi and Ramewhwar Nagar residents had to move elsewehere for safety.